Performances by Winterset native and “The Bridges of Madison County” actress Sarah Schmitt Zahn. Sarah will be singing original pieces and songs from the Broadway musical of “Bridges”. Saturday at 2:00 pm on the Penrod Stage and Sunday at 4:00 pm on the Benge Family Stage. Chain Saw Carvingby Andy Klindt. His booth will be set up across from the Madison County Chamber of Commerce office. Sidewalk Chalk Artist Kathleen Roling will create a 3D rendering featuring the Cedar Bridge at the southwest corner of the festival grounds, starting at 9:00 am on Saturday and finishing by the late afternoon. Filmmaking Contest—Stop in at The Iowa Theater between 9:00 am and 1:00 pm, Saturday and Sunday, to view and vote for your favorite original short film featuring a bridge. Screening of TheBridges of Madison County at The Iowa Theater, followed by a panel discussion with actress Sarah Schmitt Zahn (young Carolyn), Dave Trask (featured in the Northside Cafe scene) and John Reed (assisted with film production). Saturday starting at 2:00 pm. Spot a Star! Be on the lookout for famous Iowa-based movie characters walking the square. Get your “Spot a Star” card at the gate when you purchase your ticket. Snag a picture with each star and get a sticker for your card. Drop off your completed card at The Iowa Theater’s booth for a chance to win a prize pack from the theater! Both days, 10 am to 2 pm. The Iowa Theater welcomes the filmmakers behind the upcoming documentary “Stout Hearted: George Stout the Man Who Rescued Art.” Watch exclusive clips alongside Stout’s granddaughter and other family members. Stay for the feature film The Monuments Men. ($6/adults, $5/seniors and children under 12.) Saturday at 6:00 pm, The Iowa Theater. 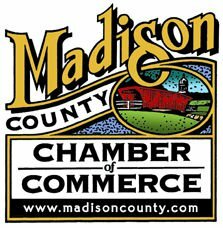 Madison County Scenic Byways Art Piece Dedication, join the Byways Art Selection Committee for the dedication of the art piece “The Story of George Stout” by Michael Goodall. Coffee and a snack will be provided. Saturday at 8 am, corner of 1st and Washington (school administration building). Guided Church History Tours, First United Presbyterian Church, 210 W. Green St. View rose stain glass windows and a rare pipe organ, plus learn about Madison County’s connections to the Underground Railroad. Saturday between 10-11:30 am, and 2:30-4:00 pm. Winterset Art Center — Stop by to view the new gallery exhibit, “Variations”, by artist James Givan. Art pieces are for sale. Stay to tour the studios and enjoy free hands-on children’s activities. Saturday, 10 am to 4:30 pm; Sunday, 10 am to 1 pm. See the full schedule of activities at entertainment for the 48th Annual Madison County Covered Bridge Festival, October 14 and 15, at this link.